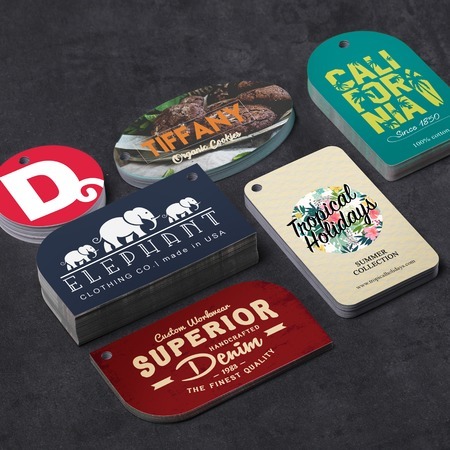 Stand out with die cut hang tags for your promotional campaigns. More than the usual hang tags used to maximize small marketing opportunities, you can make them more eye-catching by printing them in die cut shapes. Be sure to include important details about your brand to make it easier for your potential market to know more about your business. You can use vibrant colors in your design to make them more attractive and have them printed on both sides so you can include more details. UPrinting offers custom printing for your hang tags at affordable rates. You can choose among different die cut shapes available - rounded corners, leaf, single rounded corner, half circle side, oval and circle. Our hang tags are printed on durable 14pt cardstock in gloss, matte and high gloss finishes. We also offer optional hole drilling. You can get 25 up to 10, 000 prints in just one job order. Just navigate our calculator and upload your file to place an order. You can have your design printed in 2 to 6 business days. For more questions or concerns, feel free to contact us at 1.888.888.4211 or click the Live Chat button above and one of our customer service representatives will be happy to assist you!